Open any existing page or post in the WordPress editor. A new section named PilotPress Options will be at the top right, showing the membership levels you created in ONTRAPORT. You can apply one or more access levels, set the protected page or post to be displayed in menus to non-members, and set the On Error page (the page you show to someone who does not have the correct access level). To learn about protecting content using shortcodes, view this article. PilotPress creates discrete access levels, and does not enforce a hierarchy of access. 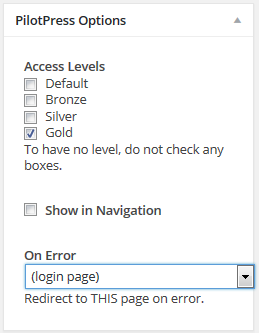 A Gold Member does not automatically inherit Silver and Bronze levels. On each page or post, you set the access level by checking the appropriate checkbox. The protected page or post will appear in navigation menus only if the member has access and is logged in. To show the page or post in the navigation menus even to non-members select the Show in Navigation checkbox. This option can be used in combination with the On Error setting to promote purchasing access by non-members as described below. The On Error setting allows you to direct non-members who try to access the page or post to any other page. The default is to show the non-member a login page. You can redirect to your home page, or use the redirect as an opportunity to generate more opt-ins or sales. For instance, create a page selling Gold level access to encourage non-members to purhcase access. Or, redirect all your pages to a page showcasing how to access all of your paid content. 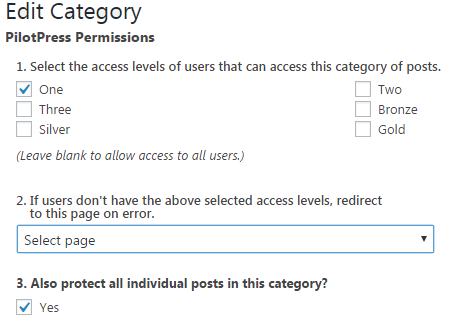 To protect entire Categories in WordPress, navigate to Posts > Categories. When you create or edit a category a PilotPress Permissions section appears. Select the membership level you created in ONTRAPORT that should have access to the posts in this category. Select the page to redirect members who do not have access to the category. Note that the Also protect all individual posts in this category? checkbox will be selected. After saving the category all of the posts will be protected. To unprotect all the posts, edit the category and uncheck the Also protect all individual posts in this category checkbox. 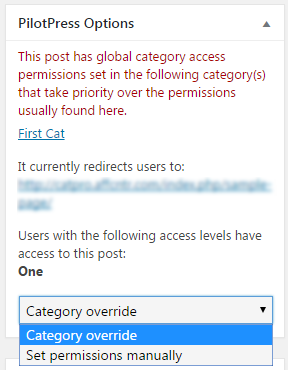 To override the category protection in one or more posts in that category, open the post in the WordPress editor and select to override the category protection.